Happy Easter! Fields are Open!! Finally the news we have all been waiting for...Fields are open!!! Practices for some teams begin tomorrow. Please look online at www.LaconiaLL.org or contact your manager/coaches for your preseason practice schedule. Now that fields are open, should there be inclement weather or closed fields we will email only if the league cancels events. Also your event will be cancelled online with notification to you. Please do not email or text the league for weather/game status updates as we will not be able to answer you in a timely manner. We will always monitor and always notify everyone. 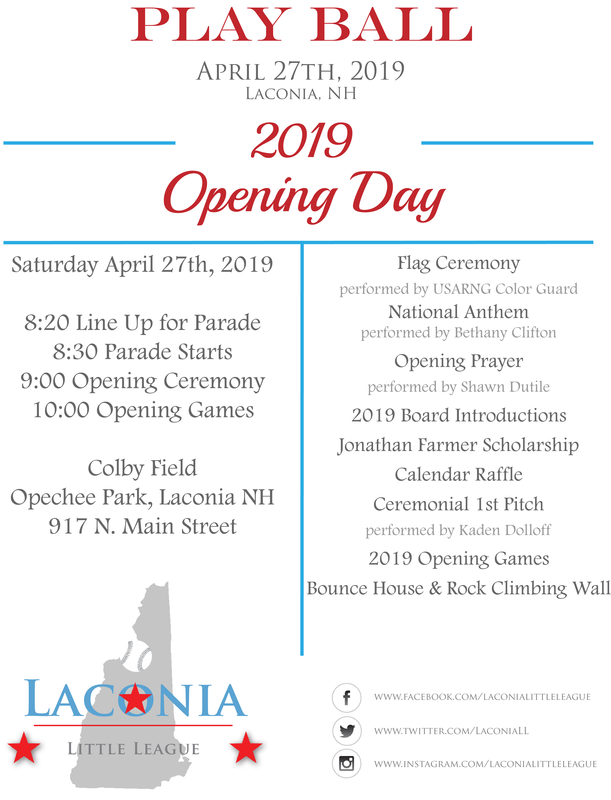 Parade - arrive at 8:00 am at the Belknap County Courthouse for an 8:30 am march through downtown Laconia to Colby Field for our annual Opening Day Ceremony. Calendars - We will draw the winners of the calendars for April 20-27 on Opening Day. Please continue to sell your fundraisers - for every calendar sold the player receives one entry to win one of our great prizes! Team Shirts - They will be delivered this week and Division Directors will contact coaches to pick them up. Practices - As soon as fields are opened by the City we will let coaches know. Practice days and times will be based off of the chosen preseason practice schedule. Again, the fields are still closed and no one is allowed on Opechee Park fields A, B, or C.
Schedule changes - The schedule is online through May 3. It will be changing!! The games scheduled for Saturday, April 20 will now be on Saturday, April 27 at the same times and locations. When all changes are complete a league wide email will be sent out. There will be no games played between Saturday, April 20 and Friday, April 26.